You can create specially themed playlists in Windows 10 to liven up long-distance drives, parties, special dinners, workouts, and other events. A playlist is simply a list of songs (and/or videos) that play in a certain order. So what? Well, the beauty of a playlist comes with what you can do with it. Save a playlist of your favorite songs, for example, and they’re always available for playback with a single click. Open Windows Media Player and find the playlist. Don’t see the playlist hugging Windows Media Player’s right edge? Click the Play tab near the top-right corner. Or when the player is in Now Playing mode, right-click a blank part of the Windows Media Player window and choose Show List from the pop-up menu: The list of currently playing items appears along Media Center’s right edge. Right-click the album or songs you want, choose Add To, and select Play List. 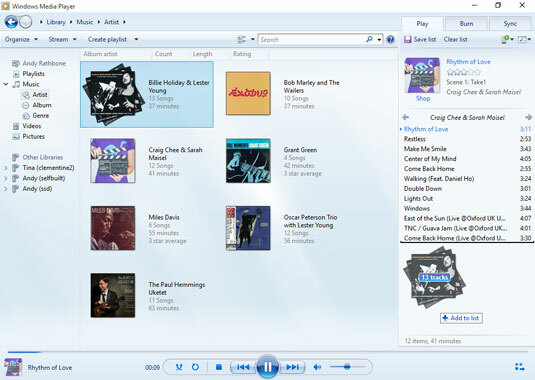 Alternatively, you can drag and drop albums and songs onto the Playlist pane along Windows Media Player’s right edge, as shown here. Either way, Windows Media Player begins playing your playlist as soon as you add the first song. Your song choices appear in the right pane in the order you’ve selected them. Choose items from the middle pane and then drag and drop them into the rightmost pane. Fine-tune your playlist to change the order or remove songs. Added something by mistake? Right-click that item from the playlist and choose Remove from List. Feel free to rearrange your playlist by dragging and dropping items farther up or down the list. Check the line at the bottom of the playlist to see how many items you’ve added to the playlist as well as your playlist’s duration in minutes. When you’re happy with your playlist, click the Save List button at the list’s top, type a name in the highlighted box, and press Enter. Windows Media Player lists your new playlist in the library’s Playlists section, ready to be heard when you double-click it. After you save a playlist, you can burn it to a CD with one click, as described in the next tip. Make your own Desert Island Disc or Greatest Hits playlists and then burn them to a CD to play in your car or on your home stereo. After you create a playlist of less than 80 minutes, insert a blank CD into your CD burner and click the Burn tab. Take up the player’s offer to import your current playlist and then click the Start Burn button. To edit a previously created playlist, double-click the playlist’s name in the Library’s Playlists area. Rearrange, add, or delete items in the playlist and then click the Save List button.